The Christmas season and all of its various forms of celebration can be a time of great joy for some, while a sad depressing time for others. I have wonderful memories of the awe and wonder I felt as a child. My sisters and I loved to sing. We knew the words to nearly every Christmas song of the time. We would sing in the car, when we went to look at the Christmas lights. I am certain it drove my father crazy, but he never told us to stop. This could have been due to his being in a band during his younger years called the Hot ‘N’ Tots. He played banjo. Belle, Bad Boy and I looked for some type of Christmas show to go to celebrate our spirit of Christmas and our friendship. I suggested going to see White Christmas. It advertised as a sing-along, which immediately brought back childhood memories. I loved the movie and watched it every Christmas, sometimes more than once. I suggested it to Belle and she agreed. The Bad Boy was dragged kicking and screaming. None of us had thought to get tickets in advance to the refurbished downtown Cary Theatre. We arrived at the door after jockeying for a parking spot, to see a sign stating the performance had been sold out. We were very disappointed and were turning to leave when a woman popped her head out of the door and told us the woman behind the ticket counter wanted to speak with us. We went inside and the woman asked how many tickets we needed. I told her three, she handed me the tickets, said Merry Christmas and there would be no charge. We gave her our heartfelt thanks, and got in line to enter the theatre. We were given a bag the contained a booklet with the words to the songs in the movie, jingle bells and a bag of “snow”. We were given both written and verbal instructions of our sing-along duties. The theatre was packed so we sat up close and personal on the front row. Excited moviegoers surrounded us. The group had teenagers who were stating they had never seen the movie and did not recognize any of the songs. The Bad Boy admitted he had never seen the movie and Belle stated she had only seen it once, so that made me the seasoned movie viewer. This has to be hands down the best holiday event I have attended. There was full-on audience participation. People sang loudly, oohed and awed, coughed, whistled, hissed or meowed and threw the fake snow. By the end, the audience and the theatre were both covered in snow. People were smiling and laughing as they left the theatre and all had a great time. I heartily recommend this event and plan on going next year. 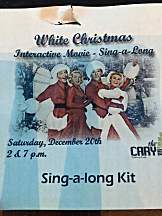 A special thanks to Joy Ennis and her staff for organizing this great Christmas event. Great job! Our next step in our celebration was the Tupelo Honey Café. We had been hearing great things about this new eating spot and it truly lived up to its reputation. We were immediately greeted and seated. Our wait staff member, Melanie, immediately made us feel welcome and special. We were pleased with the décor and the atmosphere at the café. We started the meal with fried green tomatoes and Appalachian egg rolls. Melanie was checking on us, to make sure were enjoying our meal. She asked if we liked the appetizers. When I am asked, I give an honest answer. I told her that we had not like the fried green tomatoes, and Belle had agreed. We loved the egg rolls and felt they could be a meal in themselves. She looked concerned and sent the manager, Reed Tester to our table. He apologized and asked what was wrong. We explained we did a blog and were doing a review on the restaurant. I told him the concerns about the tomatoes; cut too thick, not fully cooked and lacking seasoning. He thanked me for the feedback and offered to get us a different appetizer. We declined, but he did send-over a wonderful dessert after we finished our meal. We were very pleased with his demeanor and the attitude of respecting the customer. A big thumbs up for the Tupelo Honey Café customer service! The Bad Boy ordered the Fried Chicken and Biscuit entry. 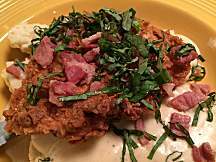 The dish was plated well, the chicken was moist and flavorful enhanced by the crispy ham and basil served over buttermilk biscuits. We give it 4 tires. Bob and Jack were both pleased with their small taste and agreed it was definitely a 4. Belle ordered the Shrimp and Grits. It consisted of 7 large shrimp served with goat cheese, ground grits with a red pepper sauce. For a mere 45 cents per ingredient, add-ons could be done. Belle chose to add bacon and mushrooms, and to have less spice added. The grits were smooth and velvety, with great flavor, with the shrimp sautéed to perfection. We agree, as did Bob and Jack this was a hit and was unanimously rated a 4. I ordered the Grilled Bone-in Pork Chop with Braised Figs. The chop was hand cut, weighing 12 ounces. 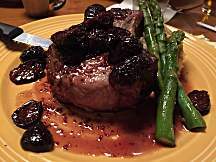 I was moist and tender, with its taste enhanced by the braised figs. The combination was delightful. I substituted the smashed cauliflower for the sweet potatoes and they were tasty. Once again it was a hit around the table and with my boys Bob and Jack, receiving 4s. We were served a succulent piece of pecan pie. It was sweet, but not too sweet topped with whipped cream. It was rich and decadent. We enjoyed it so much Bob and Jack did not get to sample it. We just won’t tell them. The Tupelo Honey Café is a definite place to go. We plan on returning soon to enjoy the gastronomical delights and the outstanding customer service. Valet parking is a plus. We drove around Cameron Village enjoying the Christmas lights and decorations. We arrived back to the house and it was time to exchange gifts. I hope the Bad Boy and the Belle were as pleased with their gifts as I was with mine. It was a wonderful day spent with friends, which hold a very special place in my heart.